Alongside the release of new MacBook Pros, Apple has also announced a developer preview for Mac OS X Lion. The official release of Lion isn’t expect until this summer, but until then developers will be able to download the operating system to test their applications. This time Apple is distributing the beta to developers in a new way. Developers simply type a redemption code into the Mac App Store and are then offered a download link for the software. My hunch is that this will be a purchase option when Apple releases Lion to the public. But, I’d be willing to bet that a boxed version will also be available through retail channels (if only for a limited time). Apple has also offered more details on the new features in Lion. Some of the features listed on Apple’s Lion page have already been detailed at the Back to the Mac event while others haven’t or were only mentioned in passing. Lion’s Auto Save feature will allow applications that support it the ability to save your work for you. There will be no need to manually save your files anymore, instead you can just keep editing with peace of mind knowing that the application is taking care of all of the saving for you. A feature that works hand in hand with Auto Save is Versions. 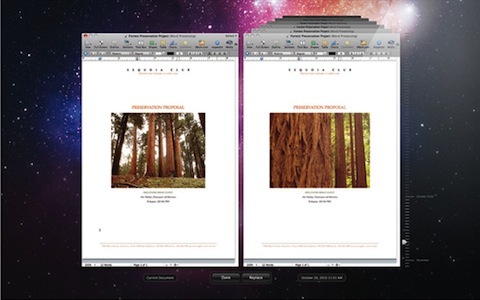 Versions keeps track of document revisions and works like Time Machine for individual files. A new revision is created each time you open the document and a new one is saved every hour that you work on it. With Versions you can revert to a previous revision or copy and paste sections of an older version into the current one. I taught myself to save every few minutes years ago, but for most users saving is a chore. Auto Save will be a welcomed addition to OS X and will be another reason for PC users to make the switch. And, I can just see the eyes light up when I explain the idea behind Versions to some of my friends and family. However, aside from the ability to copy and paste between different versions, I’m not really sure how Versions is any different than Time Machine from a user stand point. All the user knows is that their file is backed up every hour, I could see some confusion arising for some users trying to figure out which feature to use for what situation. And, likely building on top of Auto Save and Versions is Resume. Resume will allow you to restart your Mac and return to what you were doing without missing a beat. All of your opened application windows will resume right where they left off, in the exact location they were in at the time you restarted. Apple has also packed a new version of Mail into Lion. Mail 5’s changes seems to be less about new features and more about bringing the new interface style to the app. Mail’s new layout is designed to take better advantage of widescreen displays and the new toolbar looks more like an iOS application than it does a traditional Mac app. But, that doesn’t mean there isn’t any new features in Mail. Mail 5 includes “a powerful new way to search” and a conversation view that will help you follow the thread of an email conversation. You can even file or delete entire conversations at once. 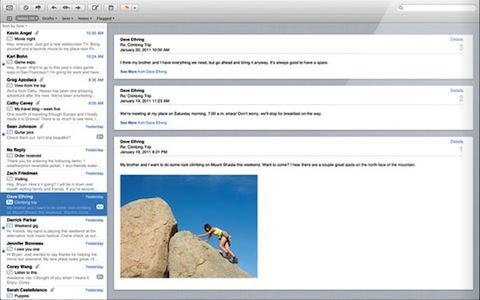 Mail 5 looks great but I don’t think I’ll be finding myself moving from Sparrow unless Lion’s Mail ends up being significantly faster than it. When it comes to email clients I’ll take speed over styling any day. AirDrop is a new feature that I’m really excited about. AirDrop will allow you to share files to other computers on your network without any special setup or settings. Just click on the AirDrop icon in Finder and drag the file onto the computer’s name. Once accepted, the file transfers to the other computer’s Downloads folder. It sounds like you’ll have to approve the file transfer on the other computer, but if that feature could be turned off AirDrop would be incredibly useful to me. I’ve been planning on building a media server out of a Mac Mini or old MacBook for a while now and AirDrop could be a quick and easy way to throw torrent files onto the media server. I could then setup Transmission to automatically add those torrent files and start downloading without any interaction other than dragging the file from one computer to the other with AirDrop. FileVault provides XTS-AES 128 data encryption at the disk level. Encrypt all of the data on your Mac in the background while you work. FileVault can also encrypt your external drives and provides the ability to wipe all of the data on your Mac in an instant. I don’t have any use for FileVault and don’t know anyone who does. But, if you are even remotely interested in encryption, you likely now much more about it than I do. The standard version and the server version of Mac OS X are no longer separate products. Lion Server is now built into Mac OS X. You will have to choose whether or not it will be a server during installation but you’ll no longer have to pay a separate license. Lion Server will feature Wiki Server 3, Profile Manager, and File Sharing for applications such as Keynote, Numbers, and Pages for iPad.